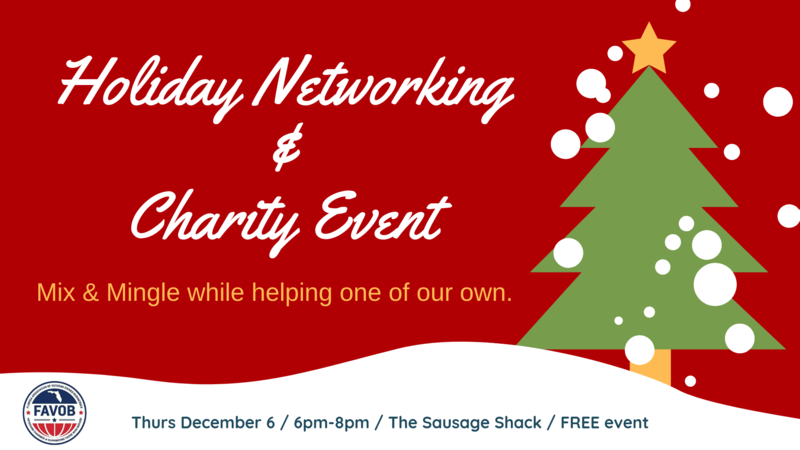 Join FAVOB as we come together to ring in the Holiday Season and raise funds to help one local Veteran Family have a Merry and Bright Holiday. We are working with several local charities to select one veteran family in need whom we will collect and distribute cash donations to. We have a modest goal of just $500 (we hope to exceed that!) 100% of your donations will go to this family!! Special event pricing: $2.50 draft beer and $3 house wine (what a deal!). Admission is FREE, however we expect EACH attendee to make a donation, whether it's $5 or $500. We can take cash, check, or credit/debit cards.